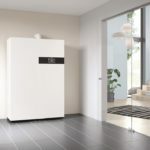 Heating systems manufacturer, Viessmann, has announced the launch of its new Vitovalor PT2 fuel cell micro combined heat and power (mCHP) boiler. Viessman believe that Vitovalor can generate enough electricity to cover the basic demands of an average household, save up to 40% of household energy consumption and reduce CO2 emissions by up to 30% compared to separate heat and power generation. It has a footprint of 0.72m2 and could be installed in utility rooms or roof spaces. The latest design includes a 220-litre integrated stainless steel hot water cylinder meaning many properties can free up airing cupboard space. Vitovalor PT2 has the highest possible Energy-related Product (ErP) rating of A+++. This corresponds to an annual seasonal efficiency of up to 192%. Viessmann believe that this makes it an alternative to heat pump systems. The Vitovalor PT2 is also equipped with Viessmann’s brand new E3 control platform. Over 2,000 Vitovalor units were installed in Europe last year.